Far-reaching changes in attitudes and family structures have been redefining the workforce for more than two decades—yet the workplace has remained much the same. During this time, many companies have learned that personalizing the customer experience is good for business. 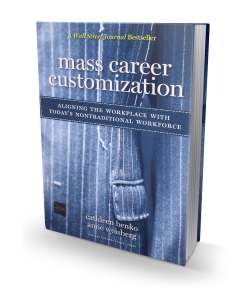 In Mass Career Customization, the authors argue convincingly to extend this popular and profitable concept to the workplace. This book is centered on the powerful insight that career options in today’s economy need to accommodate the rising and falling phases of employee engagement as it changes over time. The remarkable process unveiled in this book offers choices involving four important dimensions of career progression: role; pace; location and schedule; and workload. As the working population shrinks, maintaining industry advantage will depend largely on keeping employees engaged and connected. Mass career customization provides a framework for organizational adaptability that will do just that. Cathleen Benko is Vice Chairman and Chief Talent Officer for Deloitte LLP, the largest privately-owned professional services firm. In this role, Benko sets the strategy and leads the delivery of Deloitte’s signature talent experience to a highly skilled and diverse workforce. She is a foremost authority on talent strategies and transformational change to achieve extraordinary results. Benko is co-author of several best-selling books including The Corporate Lattice: Achieving High Performance in the Changing World of Work (Harvard Business Review Press, 2010), Mass Career Customization: Aligning the Workplace with Today’s Nontraditional Workforce (Harvard Business School Press, 2007), and Connecting the Dots: Aligning Projects with Objectives in Unpredictable Times (Harvard Business School Press, 2003). Her books have been translated into multiple languages, and her byline and insights appear regularly in such publications as The Wall Street Journal, New York Times, BusinessWeek, Time, Leadership Excellence, Continental Magazine, the Huffington Post and the Harvard Business Review. She holds an M.B.A. degree from Harvard Business School. 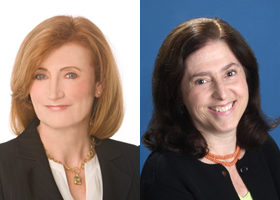 Anne Weisberg is a senior adviser to Deloitte’s Women’s Initiative.